Meal Notes: This light custard makes an elegant dessert, but I will always associate it with cozy sick days. Along with chicken soup and popcicles, my mom used this dish get me through everything from strep to wisdom tooth removal. It remains one of my favorite comfort foods and is equally well-suited to sooth a sore throat or cap off a nice meal. This recipe will typically make 6 servings. Make Custard: To the large bowl with your lightly whisked eggs, add sugar, salt, and vanilla. Gradually stir in the scalded milk. 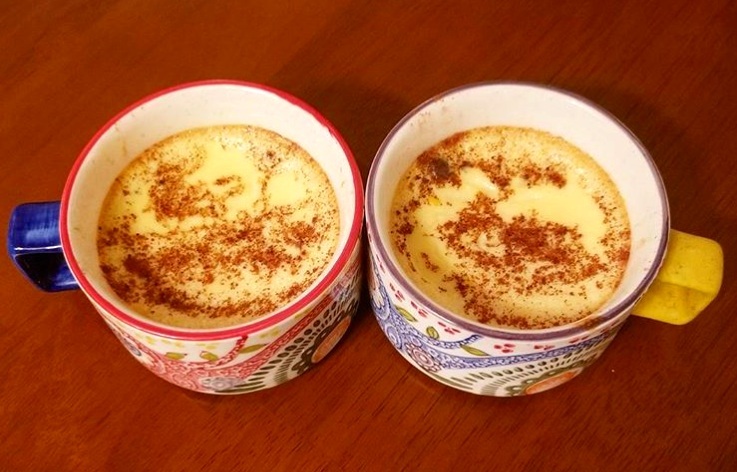 Once thoroughly mixed, pour custard evenly into shallow 6oz custard cups,** stopping when cups are 3/4 full. Bake Custard: Place cups in 13x9 pan and set on oven rack. Sprinkle with nutmeg and cinnamon. By now, your water should be hot but not boiling. Carefully pour the hot water into the 13x9 pan, until it is a within about 1/2 inch of the tops of the custard cups. Close the oven and bake custard for 30-45 minutes, or until knife inserted halfway between center and edge comes out clean. Finish: When custard is fully baked, remove from the oven. *** Custard can be served either warm from the oven or chilled. It will keep for 1-2 days in the fridge. *What’s scalded milk? : Many breads and cakes call for scalded milk as a way to make these baked goods lighter and spongier. In the case of this recipe, scalding serves to give the custard a smoother texture, while extracting more flavor from the vanilla. To scald milk, place it in a heavy-bottomed saucepan and stir over medium heat. As the milk begins to steam, continue stirring frequently to prevent a film from forming. When the milk bubbles, immediately remove it from the heat. The idea is to catch the milk just on the verge of boiling and then let it cool down to about 110 degrees F (on the warm side of lukewarm) before using. **Custard what now? Do I really need to buy special cups? Nope! While there are adorable, wishlist-worthy custard cups in the world, any small, oven-proof cup or ramekin will do. No need for the cup to be exactly 6 oz, although it should either be fairly close to that size or, if the cup is bigger, a little under-filled with the custard mixture. I use a set of little multipurpose porcelain serving bowls. My mom uses short, stoneware coffee mugs. Look around your kitchen and, odds are, you’ve got something that will work! ***Help! This water is really hot and I’m scared! Look, I’m not going to lie to you: so am I. That’s why my scaredy cat method is to first remove the custard cups from the 13x9 pan with an oven mitt (the mitt will get a little wet) and then turn off the oven. I then wait until the oven is cool to remove the no-longer-terrifying, water-filled pan. However, if you’re in an adventurous mood, you can follow my mom’s daring method of removing everything at once and just being very, very careful.